Successfully going barefoot with you horse takes getting a combination of things right. This is a simple summary of what you need to do for positive results. If you are new to barefoot, you will need to find a way of informing yourself, and some form of support or assistance if you need it. Many horse-owners going barefoot decide to find a barefoot practitioner in their area for natural trimming and general barefoot advice. If you are confident enough, and prepared to educate yourself, it is perfectly possible to do your own trimming. In the end, this is really the ideal, because it gives you the flexibility and satisfaction of taking responsibility for your own horses feet. Taking matters back into your own hands is part of the ethos of going barefoot, and we believe in the philosophy that if you really want to learn, and you have the right intention, then the teachers and information that you need will come along. If you decide to to inform yourself, then your guidance comes in the many forms of information available on barefoot and natural trimming. There are some very useful books, for example by Jaime Jackson and Pete Ramey. The internet provides an enormous amount of information, although discrimination is necessary. 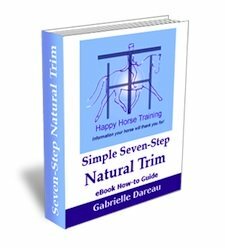 There are explanatory videos and descriptions of how to trim, as well as e-books such as HHT's Simple Seven-Step Natural Trim which provide an important detailed reference guide that you can follow and go back to whenever you need to while learning to trim. It can be very helpful to participate in a barefoot trimming clinic where you can (hopefully!) get personal instruction and hands-on experience of trimming. Make sure you find one that is given by an expert in the natural or 'wild horse' trim as opposed to other invasive trimming techniques. See Different Barefoot Trims: Our Hoof Care Journey for more on this important distinction. You can also find comprehensive information of all aspects of natural hoof care, such as diet, lifestyle, and protection on this site. The most obvious step in going barefoot is, of course, taking off your horses shoes. It is also perhaps the biggest obstacle if you are undecided about going barefoot, especially when your horse has - apparently - become dependent on being shod. We have been conditioned to believe that shoes are beneficial and necessary for a fully functioning horse, and that they are a simple necessity for those horses with, for example, flat feet, small feet, thin soles, sensitivity, and so on. However, the simple, unavoidable fact is that shoes are in no way beneficial for any horse's hoof, nor for the rest of his body. Shoes fundamentally inhibit the healthy functioning of the hoof, no matter what comfort or support they may appear to give. (For a full explanation of the reasons for this, go to The Importance of Natural Horse Hoof Care). The first of many ways you can help your horses hooves to become healthy is to remove his shoes. Unless you have the know-how and appropriate tools to do this yourself, you can ask your natural hoof care professional, or your farrier, to remove the shoes. It is important that this is done carefully to limit any extra damage to the already weakened hoof wall. The nail clenches must be removed properly before pulling the shoe to allow them to come out easily. As soon as your horse's shoes are off, you can start helping his feet to recover with a natural trim. For the initial trims, you will want to be even more careful than usual about how much hoof you remove. The natural trim always respects the integrity of the hoof, but after removal of the shoes you should leave a slightly greater height and width of hoof wall to give your horse more protection while his feet are recovering. If your horse has been shod for a long time, or at an early age, he may well have long and/or under-run heels (when the heels grow down at a shallow angle, sloping towards the toe), which will very probably also be contracted (close together due to the constriction of shoes) to a greater or lesser degree. 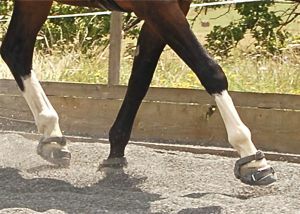 One of the goals of the natural barefoot trim is to return the heels back to their natural low height above the sole level, but this must be done gradually to avoid causing discomfort to the horse, and to allow the inner structures of the hoof (including the pedal bone) to gradually reposition themselves. So start by removing only a moderate amount of heel height, and with each subsequent trim you can take them a little lower. When you first trim after removing shoes you may well find your horse's horn quality to be weak and brittle. This is due to the decreased circulation caused by shoeing. Remember it takes about a year for a whole hoof to grow down, and this is the time it takes after going barefoot for the hoof wall you are trimming to have grown out of a hoof with improved circulation and general function. In the natural hoof care world, opinions differ as to whether hoof boots are necessary in the long term for barefoot horses, but most experts are now undivided as to the importance of providing protection for your horse's feet during the transition period when going barefoot. Like when circulation returns to numb fingers, when this happens to your horse's feet after going barefoot, it is often very painful. This sensitivity normally subsides within a month or two, but can take much longer with some horses. It is only fair, if you wish to ride your horse during this period, that you give him the protection on hoof boots, ideally with pads for extra comfort. Not only that, but it is important for the reconstruction of the hoof that the horse starts to land on his feet heel-first, and he will not do this if he has too much discomfort. See Hoof Boots: A Revolution In Horse Hoof Protection for more information. Hoof boots can help to make this difference when you are riding (even on a soft surface), and if your horse is particularly sensitive after going barefoot, you may even consider leaving his boots on during turn-out initially, provided they are comfortable and secure enough to do so. In this case it is sensible to avoid riding your horse until he becomes more comfortable, indeed most horses going barefoot will benefit from a period of rest while they are making the transition. It is crucial to success with hoof boots that you get the right fit, and you can only measure the hooves correctly after you have done your first trim. 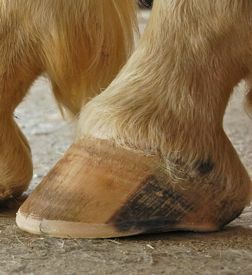 The hooves will very probably gradually change shape as they recover from the distortion caused by shoeing, and it will be necessary to change his boot size accordingly. Some barefoot practitioners provide an exchange system to make this less costly. However, whatever you spend on boots is likely to be less than what you would have spent on shoeing, and a lot more beneficial for your horse! The horse's diet is inextricably linked to the health of his feet. It is therefore impossible to ignore this aspect of going barefoot. The high sugar diet, common to many domesticated horses, produces toxins in the hind gut, which then (via the bloodstream) damage the sensitive laminae in the hooves. This causes pain and distortion of the hoof, in varying degrees from mild to extremely severe cases of laminitis. The discomfort in the feet caused by a high sugar diet is often masked by the numbing effect of shoeing, although the damage is of course still being done, but after going barefoot the sensitivity will come to light, and your horse may become very sore in his feet on a long term basis, unless you minimize his sugar/starch intake. 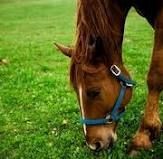 The rich green grass that we have traditionally been conditioned to believe is good for horses actually has a very high sugar content, and can be extremely damaging to horses' feet. Eight kilos of rich green grass can contain as much sugar as one kilo of molasses! The fact is that the horse is not evolved to live healthily on the kind of rich grass common in much of North America and Europe, instead the horse gut is adapted to take the most nutrients possible out of sparse, dry grasses that grow on the infertile plains of Asia. Counter-intuitively, it is the short, over-grazed grass common in horse paddocks that is the most toxic - it is especially high in sugar because it is constantly re-growing with young, sweet shoots, as well as being high in the toxins that grass produces when it is stressed. Grain, in its different forms, is a concentrated source of starch, which is converted into sugar by the enzymes in the gut. Therefore, a high-grain diet is not suitable for the barefoot horse. Different grains have different levels of starch, and one of the lowest is oats. We believe this is therefore the most suitable grain for horses, as opposed to barley, maize and wheat. If you don't feed straights, then beware of the grain content of complete nuts and mixes: many have a high proportion of these unsuitable hi-starch grains. It is a long-standing tradition to feed domesticated horses in work a lot of grain, as horse-owners often believe it is necessary to maintain energy and condition. In fact, most horses would be much healthier with a significantly reduced proportion of grain in their diet. 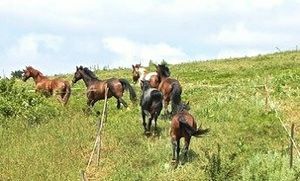 The amount you give greatly depends on the individual horse - 'good-doers' such as natives types, ponies, and so on, need very little if any grain, while Thoroughbred types usually need more. Of course, the amount of work they do is also a major factor. When going barefoot, we have to find the best balance between healthy feet and good condition. There are also ways we can replace the nutritional benefit of grain with low sugar alternatives, such as copra (coconut meal). Many course-mixes, chaffs, and nuts, not to mention horse treats and licks, have added molasses, which is pure raw sugar, and therefore bad for the hooves. Try to cut this out completely from your horse's diet - although they love it (for them, like us, sugar is highly addictive) it is totally unnecessary and unnatural for horses. So when going barefoot, switching to a hay-based, low grain diet can greatly increases your chances of success, and your horse's hoof comfort and health. Make sure you also provide a comprehensive, ideally natural, supplement, such as bee pollen. For more information on horse diet see both: The Horse Diet and its Importance in Hoof Care and How To Get Horse Nutrition Right. Even if you don't make a Paddock Paradise, the less time you can have your horse standing in a stable, the better for his feet. If your horse is sensitive to begin with, far better that he be turned out with boots, and get his feet working again the way they should, than stood in a stable. 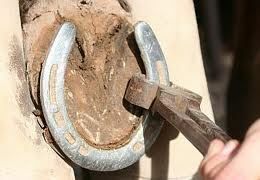 The damage that is done by shoeing can be profound, especially if the horse was shod at an early age, or for a period many years. It takes time for the hoof to recover from this - in some cases it will never return to complete health - but as with any living system if supported in the right way, it has an amazing power of regeneration (see Life's Innate Healing Potential). We personally have horses whose feet, because they had such profound shoe-damage, have only really recovered their healthy form and function almost ten years after going barefoot, but it has only been in the latter years that we really got everything described on this page together to make the difference. Taking this holistic approach to going barefoot will accelerate your horse's recovery, but it still takes the commitment and patience to let health come from the inside out. If you give up and go back to shoes, how can you ever know what potential healing could have taken place if you'd stuck it out?